Our top-selling guide! Visit the top places to rest in peace in Buenos Aires while learning about lifestyles of the rich & (in)famous. Imagine Buenos Aires 200 years ago before growing into the metropolis it is today. 55,000 inhabitants lived without paved streets, green areas or basic public services. To improve city sanitation, burials inside or near churches were prohibited, & this cemetery—the first public burial ground in Buenos Aires—opened in 1822. Recoleta Cemetery has changed as much as the city itself, & although unpopular at first the elite eventually adopted it as their own. Ornate family tombs reflect wealth & status. Stroll past Presidents & politicians (some naughty, some nice), Nobel Prize winners, literary greats, entertainers, scientists, military leaders, sports figures & even some who died tragically. Of course this guide includes the cemetery’s most famous resident. Eva María Duarte de Perón—simply Evita to her devotées—had a bizarre post-mortem journey which is described at length. Many other important tombs are included such as Rufina Cambacérès, Luis Ángel Firpo, & David Spinetto. The mix of architecture, historical figures & urban legends may make you want to stay permanently! Topics discussed in the guide include the foundation of Recoleta Cemetery, details of its current operation, symbolism found inside, plus the most accurate map available. For further information, refer to our blog: AfterLife. Documenting Recoleta Cemetery since 2007, over 525 posts discuss important family histories as well as current events affecting the cemetery today. Robert even appeared on television, guiding for the GlobeTrekker television series! 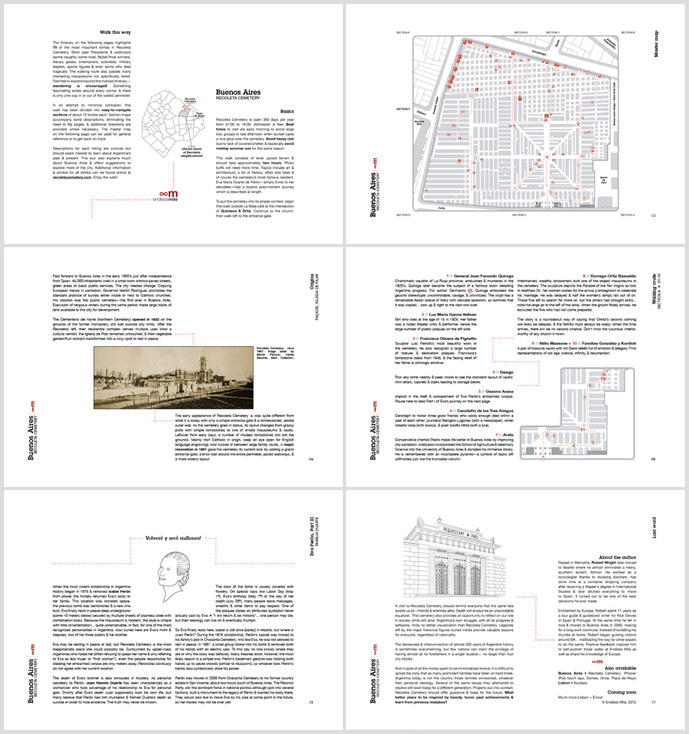 Format: PDF, A4 landscape, 22 pages. Ideal for viewing on any tablet or for print. Released Jan 2010, updated Jan 2018. This guide may not be redistributed, resold or reprinted. Duration: The route takes about 2 hours to walk & read at a leisurely pace. You may need extra time to gaze at all the architecture & take photos. Price: USD 4.99 via PayPal. A link to download the PDF will be sent to your email address after payment is confirmed. Lonely Planet, The New York Times, Wayne Bernhardson’s Argentina Travel Adventures iPhone app, LAN Airlines, Delta Airlines, and the Michelin guide Buenos Aires …Like A Local: “this labor of love is arguably the best guide to Recoleta Cemetery in any language.” Have fun & enjoy the walk!